Winner of ASLA 2017 Honor Award, Residential Design Category. 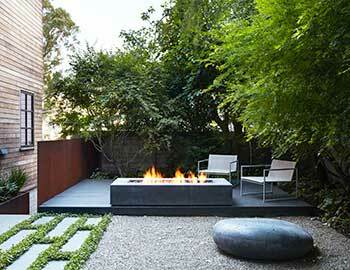 The project, Telegraph Hill Residence, was completed by Andrea Cochran Landscape Architecture. Sustainability, space for outdoor fitness activities and the ability to charge mobile devices are key residential landscape trends, according to the 2018 Residential Landscape Architecture Trends Survey conducted by the American Society of Landscape Architects (ASLA). Architects were asked to rate the expected popularity of a variety of residential outdoor design elements in 2018. The survey was fielded Feb. 22 through March 8, 2018, with 808 respondents. ASLA revised the survey this year to include new types of outdoor amenities that appeal to both single-family and multifamily owners and residents. The results are virtually unchanged from the 2017 survey, except for the additions of flexible-use space and charging stations. • Charging stations (mobile devices) (70.0 percent). The survey also took a look at the expected popularity of various products and features in six categories, including outdoor design elements, outdoor recreation amenities (single-family and multifamily residences), multifamily outdoor amenities, landscape/garden elements, outdoor structures and sustainable elements. View the rest of the survey results ranked in expected order of popularity for 2018 below. • Tennis courts (9.1 percent). • Plunge pool (18.6 percent). • Formal gardens (15.2 percent). • Geothermal heated pools (21.3 percent).